I have really gotten more excited about earlobes in the last few years, which is such an important aspect of facial beauty and aesthetics that oftentimes get overlooked. Earlobes change with age—like anything else, they can become droopy, they can “deflate,” and they can even develop folds and seem “collapsed.” Fortunately, earlobes can often be rejuvenated with volume. I think the optimal volume “filler” to rejuvenate the earlobes with soft tissue atrophy is RADIESSE® (like the backs of the hands). Usually concurrent with droopiness and aging of the earlobes, the “hole” that most women have for ear-piercings gets “stretched” and pulled down with the weight of earrings over time. Sometimes this is worsened by heavy earrings, and other times it is exacerbated by a child pulling on an earring—I’ve seen it all. In many instances, women think they should just go get a “second piercing” next to the old hole that almost pulls through in order to solve the problem. That really only makes the issue more complex, unfortunately. I like to approach the aging earlobe in a “holistic” way, taking shape, size, and fullness into consideration. Many women that come see me have large holes in their ears from aging and earrings, some patients have undergone an unsuccessful repair that caused a recurrence of their aesthetic concerns, and other individuals are simply born with large earlobes. I also see patients in the millennial generation that have followed the trend of wearing “gauge” earrings that really change the ear. Those who visit my practice really want to have their earlobes look normal again. For an example of some of the concepts I’ve discussed, take a look at the case sample below. This patient had an earlobe repair 20 years ago, but she came to me with “droopiness” of the earlobes due to thin tissues, aging, and wearing heavy/large earrings for years. The picture on the right was taken three months after I performed her earlobe repair, and the improved “lift” and shaping of the earlobe after the repair is noticeably evident. This enhancement really brings the overall size and contour of the ear back into “balance” and harmony. No one wants a droopy earlobe! An additional factor to consider in regard to earlobes is the changes that can occur after facelift surgery. 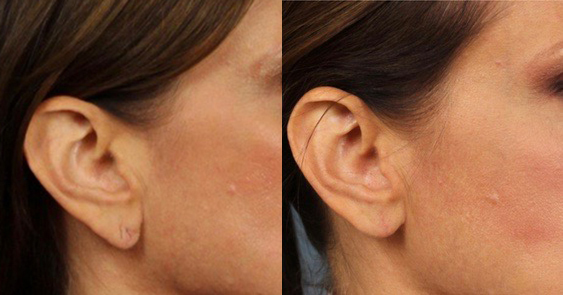 It is so common to see changes to the earlobe that can be improved after facelift because some techniques will really drag the earlobe downward. Other times, the aging earlobe stands out on a patient that has had a facelift but the earlobes were ignored. For this reason, “finishing” the facial rejuvenation with a nice earlobe repair is incredibly important! For more information about earlobe repair and rejuvenation, or if you would like to schedule a consultation at Boynton Plastic Surgery, please don’t hesitate to contact us online or by phone at 713-800-6060.